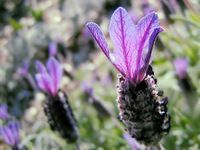 Lavender essential oil is one of the most popular and versatile oils used in aromatherapy.....and it deserves its reputation. It has such a wide range of healing properties, it is suitable for use with babies, children and pets and is one of the few essential oils which is safe to use undiluted on skin. It is very good for calming and balancing strong emotions such as panic, frusration, anger and nervous anxiety. One of the reasons that I find myself reaching for Lavender time and time again is that it has the amazing ability to increase the effects of other oils with which it is blended....so I often include it in massage blends. I also like to include Lavender in soaps, lotions and potions......well why not, with so many therapeutic benefits, and I love the aroma too. Lavender essential oil is an uplifting and relaxing oil and good for boosting the immune system. It has the ability to restore mind or body to a state of balance in which healing can take place. It is excellent for treating scars, wounds and burns. Lavender is soothing on insect bites. It is valuable in the treatment of colds and coughs. Good for reducing anxiety and stress and helps promote sleep. Suitable for all skin types. Lavender oil promotes growth of new cells and is very helpful in treating acne. Can also help relieve eczema and psoriasis. Lavender is an emmenogogue so must not be used in early pregnancy. Be careful to select the correct oil as there are many different oils sold under the name 'Lavender Essential Oil'. Fantastic for calming the mind......use the cupping and inhalation method. Put a couple of drops in your cupped palms, then inhale deeply. This will draw the aroma all the way into your amygdala gland (your emotional centre) and instantly calm you. Having problems sleeping? Then use lavender oil in a diffuser in your bedroom before going to bed and rub some oil onto your wrists and feet. Add a few drops to a spray bottle filled with distilled water, shake and use as a room spray.......balancing, calming and keps bugs at bay! Lavender has long been thought of as a spiritual oil encouraging forgiveness and compassion. If you would like to find out more about lavender and which varieties of essential oil to buy, then have a look at this page.